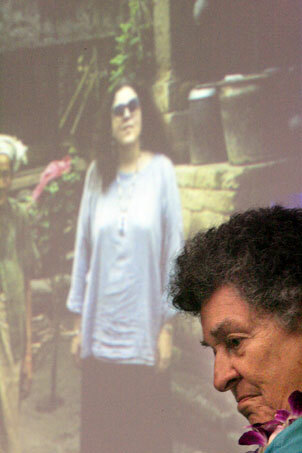 A panel discussion on the life and work of Stanley Ann Dunham was held yesterday at the University of Hawaii at Manoa. Alice Dewey reflected on time spent with Dunham, the mother of Sen. Barack Obama, abroad in Indonesia. Behind Dewey was a photograph of Dunham on Java. Barack Obama's mother was remembered for her passion as well as her practicality, her devotion to detail and her global outlook, in a panel discussion yesterday at her alma mater, the University of Hawaii at Manoa. Nearly 200 people turned out for the Women's Studies Colloquium, hoping to learn more about Stanley Ann Dunham, the woman behind the Democratic presidential candidate. They saw slides of her in flowing batik skirts, alongside villagers she befriended across Indonesia, where she spent much of her career as an anthropologist. "I was sitting here squirming -- I really have a hard time after all these years looking at images of my mom without crying, especially now when so much is happening," said Maya Soetoro-Ng, her daughter, who attended the presentation by three of Dunham's colleagues at UH. "There are so many reasons I want her to be here to offer guidance and love." Dunham died in 1995 of ovarian cancer. An anthropologist who specialized in handicrafts and rural development, Dunham helped pioneer "microfinance" in Indonesia, getting villagers small loans so they could build cottage industries to preserve native crafts and pull themselves out of poverty. "She found 'home' everywhere she went and delighted in all of the beauties and layers in each place," said Soetoro-Ng, who teaches at La Pietra-Hawaii School for Girls. "She really believed that every place and every group of people had something extraordinary to give, if we would only pay attention." "We were both so incredibly fortunate to be raised by a woman who was at once really local in honoring and respecting local ways of doing things and at the same time truly global in her thinking." Dunham earned her bachelor's, master's and Ph.D. in anthropology at the University of Hawaii. Her second husband, the late Lolo Soetoro, was Indonesian, and Dunham immersed herself in the handicrafts of that sprawling nation. Her thesis adviser, Alice Dewey, said Dunham was ready to write her dissertation on blacksmithing, puppetry, ceramics, basketry and batik but was told to choose one subject. Dunham turned in a 1,000-page thesis, "Peasant Blacksmithing in Indonesia: Surviving and Thriving Against All Odds." It is now being readied for publication in Indonesia. "Ann struck me as being a very practical person in spite of the fact that she had lofty ideals about improving people's conditions," said Nancy I. Cooper, who did research with her in Java. Dunham's personal knowledge of handicrafts, down to the mechanics of making them and the challenges of finding materials, allowed her to persuade banks to extend loans of the right size at the right time, Dewey said. Dunham worked as a program officer for the Ford Foundation and as research coordinator for Bank Rakyat Indonesia but was most at home in rural villages. "She considered peasants just as important as people of high rank," said Dewey, a professor emeritus at UH. "I think she was the hardest-working person I've ever met, and did it without seeming to be. If we have Barry as president and he works that hard, we're fine." Before her death, Dunham worked in New York for Women's World Banking, a nonprofit group that supports a global network of microfinance institutions. "We came because we wanted to know what made Barack Obama the kind of man he is today, and we certainly found out," said Yoshie Tanabe, an audience member. She lauded Dunham's "cultural sensitivity" and "common sense," adding, "She's my kind of woman."